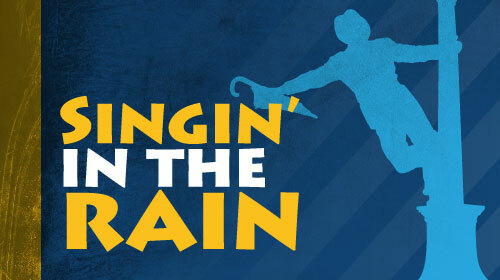 The “Greatest Movie Musical of All Time” is faithfully and lovingly adapted by Broadway legends, Betty Comden and Adolph Green, from their original award-winning screenplay in Singin’ in the Rain. Each unforgettable scene, song and dance is accounted for, including the show-stopping title number, complete with an onstage rainstorm! Hilarious situations, snappy dialogue and a hit-parade score of Hollywood standards make Singin’ in the Rain the perfect entertainment for any fan of the golden age of movie musicals. Singin’ in the Rain has all the makings of a Tinseltown tabloid headline – the starlet, the leading man and a love affair that could change lives and make or break careers! In silent movies, Don Lockwood and Lina Lamont are a hot item but, behind the scenes, things aren’t always as they appear on the big screen! Meanwhile, Lina’s squeaky voice might be the end of her career in “talking pictures” without the help of a talented young actress to do the talking and singing for her. Singin’ in the Rain is presented through special arrangement with Music Theatre International (MTI).